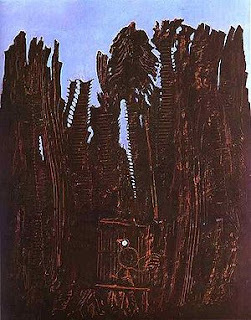 Max Ernst, The Forest, 1927, oil on canvas. Stuck in a small cage in the center of an overgrown, slightly manic forest seems to be an accurate illustration of my thoughts recently. With the pace of classes picking up swiftly and extracurricular activities also picking up, Ernst’s trees’ are grades and my social life and I’m the bird stuck enchanted, even a little petrified, of everything growing over me in the bird cage. This beautifully structured, almost industrial representation of a forest really caught my attention in more than one aspect. It reminded me of a Where the Wild Things Are scene from the new movie trailers. The image appears flat initially, like a book, but with deeper examination, the image turns into a motion picture. The tan lines that create this depth are primeval in style but there’s still modernity in the abstract nature of the lines. The lines in Ernst's image are actually a result of a technique that he created called frottage. It consisted of drawing on paper that is directly on top of a rough surface which essentially makes a modern relief. This unpredicted aspect of the technique gave Ernst's paintings an edge and contrast. The bird in the cage also adds compositional contrast in a red, sienna shade that actually looks whimsical and opposes the industrial lines. The bird’s eye looks like a sweet, white button with red stitching while the trees appear dead and lifeless. In the amalgamation of horizontal and vertical lines, there is a beacon of hope for the bird suffocated by the forest in the pale blue sky towards the top register of the painting. The sky is the light waiting to reach the bird underneath the smothering trees, just as there is a bit of liberation and bliss at the end of an emtionally overwhelming week, or maybe even month. I am a junior at OU studying professional writing with a minor in art history. artumn= art with Autumn. I will be making my way through "The Art Book," Phaidon Press, and giving my personal and uncomplicated views on all the classic pieces of art that are compiled in this book. Expect the same easy-to-read format with unique perspectives that give new life to traditional work.